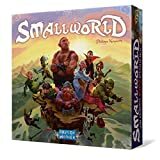 Small World is a fantasy war game with an innovative system of cycling through different civilizations and a nicely polished game system. Between 2 and 5 players vie for conquest and control of a board which is too small to accommodate all players. The conquest to be the ruler of the world while occupying the most territories is the object of the game. It's the key to combine each race with 20 unique special powers (like Alchemist, Berserk, Heroic, Flying, Underworld, Wealthy, ...) the best way to expand your empire. Expanding goes by sending troops to weaker adjacent lands or neighbors and killing and occupy those territories. Small World is one of a few games that track the rise and fall of civilizations over the course of a war game. So be prepared, even when you dominate your opponents, your race's civilization is doomed as well. You must know when you will let it go "into decline" and ride a new one to victory. A race in decline is designated by flipping the tiles over to their black-and-white side. At the end each turn, you score one coin for each territory your races occupy. You can have one active race and one race in decline on the board at the same time. Your occupation total can vary depend on the special abilities of your race and the territories they occupy. After the final round, the player with the most coins wins. Small World can be played in a reasonably short amount of time: an hour or an hour and a half. It has a pretty uniquely European war game design, which means that more time has gone into polishing the game system. 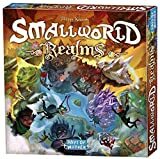 The great thing about Small World is the variety of strategies that come up depending on what Race and Power combinations are available every game. This leads to a lot of possibilities and constant challenge to your skills to evaluate the races and powers. Remember that not every Race and Power is equal and some are definitely better than others. The active player can select the first race from the racial queue for free, or he can take a further one by placing a victory coin on each race he skips. The combat system is fast and simple and no luck is involved. There are simple defensive rules : every piece or unit on a space increases the cost to take it by one. The rise-and-decline system that underlies everything is what brings the game up to the next level. This limits your expansion in a clever way as you need more units to take a territory than you need to hold (it does this in an organic way that you scarcely notice). There's very little randomness in Small World. You take a region by paying 2 race tokens + 1 race token per mountain, opposing race token, or other defensive piece on the space. You place those tokens you spent in the space you're conquering, and your opponent is forced to take his pieces off the board. Then it introduces a very important decision point in the game: when you need to push out your old civilization and start a new one. The game is designed by Philippe Keyaerts and similar to his previous award-winning Vinci which was released by the French publisher Descartes. Smallworld looks considerably nicer than Vinci, but it also introduces some usability muddiness which can slow down gameplay and every game mechanic change from Vinci to Small World was a good one.